Dean Schneider, a rancher in Oklahoma, is moving to year round grazing after decades of making and feeding hay. Here’s how he’s managing the change. Dean Schneider owns and operates Bell Rule Genetics, a family ranching operation focused on cattle that fit today’s cattlemen and beef industry. Click on over to learn more about what they do and the bulls, cows and heifers they have available. Two years ago, I made the leap and attended a Ranching For Profit School. I had contemplated it for years, but the cost seemed prohibitive. Our 4th generation operation had been successful, but I was searching for more. As seems to always be the case margins were continuing to get squeezed. I felt that if this operation was going to move on to the 5th generation, profitability needed to increase. I’ve always been a numbers guy, so while the financial part of the class was beneficial, learning about better management of grass and soil was to be my enlightenment. Coming out of that school, it seemed that reducing the machinery, labor, fuel, repair costs, etc. from hay was the low hanging fruit I could get. I didn’t realize that thoughts of improving my grass utilization would ultimately lead me to my realization that it all comes back to the DIRT. Soil health! That’s a tangent for another day but I sure believe that soil health is the basis for it all. 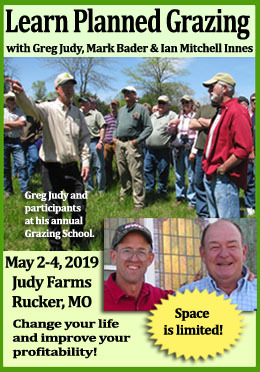 So after thinking the RFP school was too expensive, my nephew and I have attended numerous schools over the last two years on grazing and soil health – sound investments that I plan on continuing. I have learned more about grazing and soil in the last two years than I did in my first 50 (including the 4 years and BS degree in Agriculture!). The basis of our operation consists of 500 mama cow of which 200 are registered and the rest commercial. We have long believed in the smaller efficient mama cow so our genetics fit well with year-round grazing. We sell calves at weaning, as backgrounded feeders or sometimes we take them all the way to the packer. It is my belief that versatility is paramount to profitability. When the markets or weather throw a curve, it is great to have the ability to adjust. Sometimes I feel we have too much overhead, but it sure pays dividends at times. Additionally, we market commercial and registered bred heifers and registered bulls. As I stated above our goal became year-round grazing and elimination of as much hay as possible. That first summer we began laying out paddock designs to provide for rotational grazing. I should mention here that we had already been rotating every 5-7 days on several parcels, so we planned on starting by getting that down to 1-3 day rotations. So that first summer we built fence, laid water lines, and increased our rotation frequency. We also baled all the hay we previously had! Not ready to go cold turkey you could say! That first winter with improved rotations led to better utilization and a little more emphasis on growing more stockpile, and we were able to gain about a month of extra grazing. One group of 60 cows was even able to make it the whole year with only two bales of hay (that we used for candy to lead them across the road)! So I started to really believe this could work. That led us to last spring when we made the decision to throw all of our owned hay fields into the grazing rotation. We had a couple other rented hay fields that were not fenced that we continued to bale. I wanted an insurance policy of hay in case this didn’t work so I began looking for some hay to buy, but we had a very slow spring and the first cutting was only about half of normal. Hay couldn’t be bought reasonably. Luckily we got some mid summer rains and the second cutting was good enough to fill the barns, but we were still short of what I wanted. So, I sold the calves last fall after 60 days of preconditioning – some of that adjusting to the the hand you’re dealt. Back to the grazing. Last summer we intensified the grazing rotations down to one day with one group of cows and 1-3 days on two other groups. We could start to see some improvements in pasture conditions and increased beneficial insect activity. The fall brought more dry weather and a lack of growth for winter stockpile (another factor in selling the calves early). The plan to have the hay pile insurance policy was looking pretty good. For the first time we started intensively grazing and rotating through our stockpiled grass. Wow! What a difference that has made. At this point I believe we have gained about another month on our year-round grazing goal. It wasn’t until the 10th of January that I started to feed hay to one group of 60 fall pairs. The other group of 85 fall pairs should be able to graze for another 2-3 weeks. Last year the fall pairs started hay the first of December. Our spring dry cows,that we are rotating, are still grazing and should be good for another 2-3 weeks. We have started supplementing one group with higher protein hay on a limited basis to stretch out our low quality bermuda stockpile. Again this year we have one group of 80 dry cows (in the video below) that it is looking like might make it til spring greenup. After the dry fall, our winter has turned wet and we are using more forage than we anticipated. Again I’m glad we have that hay insurance policy for backup. I have no doubt we are gaining on our goal. We are continuing to divide fields and lay water lines. That combined with a lot of temporary fencing has allowed us to stretch our stockpile. We plan on continuing to increase our rotations and stock densities. I keep thinking it won’t work to increase rotations, but then 6 months later we are speeding it up again. I had a lot of reservations about the temporary fencing and work it would take to move the cows daily, but it really hasn’t been bad and I think it is easier and faster than hauling hay out to the cows. So far I am happy with our choices and I realize that it is a learning process and we have along way to go. Then again, I don’t ever want to stop learning so it should be a fun journey. My advice so far would be don’t be afraid to try things. We should have done this years before but, I was unwilling to make the leap. Forty years ago when hay baling was cheap, we were playing with a different set of rules. Times change and so must we. But don’t be afraid to have an insurance policy! 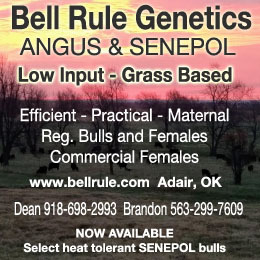 I am part of Bell Rule Genetics, a family Ranching Operation in Northeast Oklahoma with 400 commercial cows and 100 registered Angus cows. We have been raising cattle for over 100 years. Our focus is on producing cattle that are efficient, productive and fit the needs of today's Beef Industry. At Bell Rule, we have built our Registered Angus Herd with the commercial cattlemen in mind. 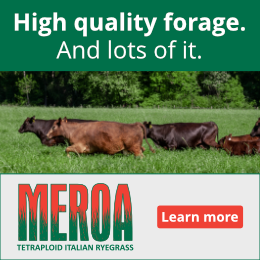 They are based on moderate framed, easy fleshing, maternal cattle with carcass capabilities.﻿﻿ Currently we raise Registered Angus bulls, commercial bred heifers and cows, feeder cattle and fed cattle for local butcher shops and premium age and sourced programs. In addition, we have a select herd of Foundation bred Quarter Horses. Never too old to learn are we. What’s the best system you have found to parent verify? It’s funny learning about stuff in school that you didn’t care about was boring, but it’s very enjoyable when you like the subject! We do most everything through the Angus Assoc. and use Zoetis. I really don’t have much of an opinion on whether they are better or worse than anyone else. We prick the back of ear with a needle when we are tattooing the calves. It works pretty well for most of them. It is interesting that your are operating three different herds. Do you see yourself working toward high density management intensive grazing? In this case you would move one large herd instead of three. That is a tough one for us and we have struggled with how how to eliminate herds. We actually have many more than three. Our operation is on seven different properties that are not close enough to run as one. Additionally, we have a registered herd, a commercial herd, and spring and fall calving groups in both of those. Five of the properties are down to one herd. It is definitely something that we are working on, just not there yet. One other thing, we have started to combine registered and commercial cows and multi-sire breed them. After birth, we then are DNA parent verifying. This has helped with reducing the number of herds. Nice article. Thanks for telling your story. It is a story I have heard many times before. The hesitancy to make that first step is what holds most producers back. The progression from 5-7 day moves, to 3-4 days, and then finally to one-day moves is the game changer (and life changer) for many. Good luck & Good grazing! Thank you. It’s a process for sure, but we are gaining. Your school was one of the foundations for our progress and future plans.